If your precision custom metal stamping application requires a full progressive die environment, blanking, forming, coining, deep draw and metal forming we have the in-house capability to handle your custom production metal stamping requirements. 1. 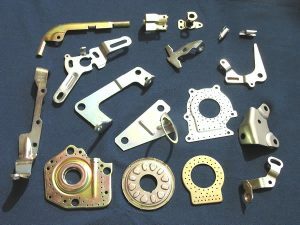 Professional in stamping parts with the different materials: In both ferrous and non-ferrous alloys (carbon steel, stainless steel, aluminum alloy, brass and bronze alloy). 3. All kinds of surface treatments are available: Polishing, zinc plating, nickel plating, chrome plating, power coating, phosphate coating. 4. Punch equipment: Single press machine, AUTO press machine, hydraulic press machine and auxiliary equipment, such as tapping machine, welding machine, deburring machine, feeder, etc. 5. Mould type: Progressive die, single press mould, transfer mould, etc. 6. Very high production rate assure low production cost. 7. Service: CNC machining, fabrication, welding and assembly available. 8. Compliant with ISO9001 compliant. QC manual for metal stamping available upon request. Send CAD drawings in DXF or IGES format. We are pleased to offer technical and working knowledge in all phases of your metal stamped part.